The Buba Corporation: The Bubalaires! IS IT TRULY THAT TIME AGAIN? YES! YES INDEED IT IS! At the Elegant LOST STUDIO in Hollywood, California! MAKE YOUR RESERVATION NOW -- SEATING IS LIMITED !! west side of the city as well as in the downtown. Oh, and in good old San Francisco, to boot! are fans and friends of The Bubalaires. of Buba-quality hilarity for, on the average, $10.00 U.S.!!! Visit the Bubalaires' EVENTS page for more detail on such things as events, if any. SEE! "A MUD-WINTER NIGHT'S DREAM" STARRING THE BUBALAIRES! SEE! "SOCK PUPPET INFERNO" STARRING THE BUBALAIRES! "The Theme from The Beaverchop Show!" to place a file on your own hard drive! or cash payment of any type. Hello, interested party! We who are the Bubalaires greet you in a most electronic manner, enjoying with you the many modern benefits offered by cybernetic devices far too complicated for us to comprehend. If you have understanding as to how this world-a-wide Webbing functions, please find a way to explain this to us. Or better yet, nevermind, since here we are irregardless! So here we are, the Bubalaires! Thanks to the generous insistence of the all-powerful Buba Corporation, our sponsor and, in a very real sense, the master of our fate, we are kept here in America, far from our home in beloved Czeznovia. The Bubalaires are the former Art Theatre Collective of Czezno-Kocheski, and believe us, not one hour passes in which we do not bewail the old days of international tours with a 97-person troupe of classically trained actors, dancers, acrobats and singers, not to be mentioning our finely-trained and well-behaved bears. 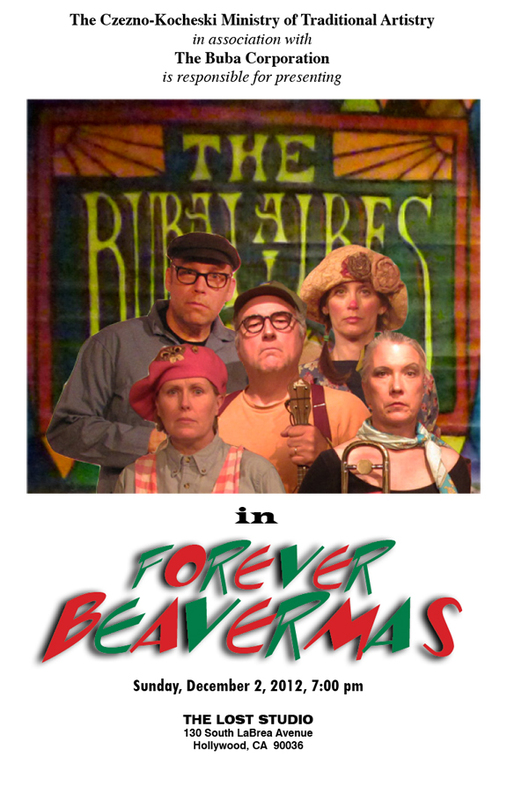 Se the formerly Art Theatre Collective of Czezno-Kocheski are now and evidently evermore THE BUBALAIRES! And we will do our uttermost to provide you with a spectacular evening of magical feats of theater! And perhaps fishwine and prune and corn cake to boot! Main | Repertoire | Events | History | Links | Read About Us! Book Us! Email us!